Various Artists - Soul Jazz Records Presents SOUL OF A NATION: Jazz is the Teacher, Funk is the Preacher - Afro-Centric Jazz, Street Funk and the Roots of Rap in the Black Power Era 1969-75. Vinyl LP. Bleep. 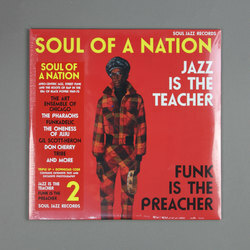 The eagerly-awaited second edition of Soul Jazz Records’ Soul Of A Nation compilations finally drops. Jazz Is The Teacher, Funk Is The Preacher is another unshakeable collection of tracks drawn from one of the most vibrant musical epochs of the 20th Century. As expected, the likes of Gil Scott-Heron and the Art Ensemble Of Chicago both contribute cuts. There are also lesser-known but equally vital pieces from acts such as Detroit’s Tribe and Chicago fusion band The Pharaohs.